Tingla Skatepark - 2nd of October from 10:00 am until 1:00 pm. 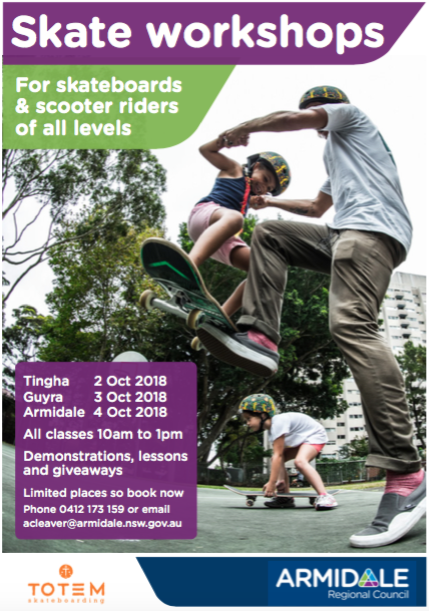 Guyra Skatepark - 3rd of October from 10:00 am until 1:00 pm. Armadale Skatepark 4th of October from 10:00 am until 1:00 pm. These programs will be free for the community and will include a 45minute Skateboard safety workshop and 45 minute Scooter Safety workshop. The day will also include a demo and giveaways. All participants will receive a free Indigenous print helmet and drink bottle.